Today was a big day. We rose before the crack of dawn and drove down to Fort Lauderdale. 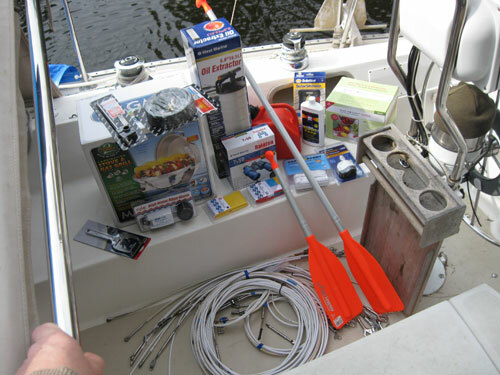 After dropping off the supplies we brought from Stuart at the boat we headed to the West Marine Super Store. This store is huge! Luckily we came prepared with a list of the items we wanted including model numbers. We found a West Marine associate, read from our list and followed him around while we loaded up two carts. 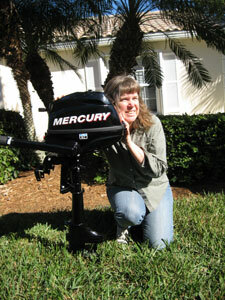 We picked out a brand new outboard engine for our dingy, picked up our new life lines and dropped three grand. Back at the boat we started to install our new lifelines. There was a problem. The forward life lines were fine, they looked all wonderful, shiny, new, and gleaming white. Installing them was easy. But the aft and gate lines were wrong. At first we thought this was our fault, then we thought it was West Marine’s, it ended up being a combination of both. We were told by several people to simply remove our old lines and take them to West Marine so they could use them as a guide to make the new ones. This seemed simple enough (except, of course, for the removing our old lines part – Duwan’s bruise is slowly fading) and it was, except we did not realize our lifelines were configured in a nontypical way. The fixtures on them were unusual. Our rigging guy was confused, but because he had no more information than what the lines themselves provided he went about recreating them with standard parts that seemed to match what we had brought him. We returned the faulty lines and had a little back and forth with the rigging specialist before we all understood what the problem was and how to fix it. Our guy at West Marine really ended up coming through for us. He cancelled an appointment he was about to go to and made the corrections in short order. He also gave us a big price break (after he learned that the markup on them was 100%) on the new connections the lifelines should have been created with in the first place. Lesson learned: If you have an old boat don’t assume that anything can be replaced with standard parts. Next time we will take pictures, make drawings and measure with a micrometer. In Atlanta your day is not complete until a homeless person comes up and asks you for money. In Fort Lauderdale your day is not complete until some guy drives up in an unmarked van while you are walking through a parking lot and tries to sell you a home theater system. It’s OK. He will leave you alone if you explain that you don’t have a home to put the theater in. How was the trip to Port Salerno? I’m really starting to miss y’all! Congratulations – You are living an AWESOME DREAM. I followed your BLOG, you are learning; Both of you, give a thought to some bicycles, particularly the fold up kind to store on your boat. The Manatees reminds us of our living in the Bradenton City Pier, our boat was a Carriecraft catatmran? on twin hulls, the Manatee lived between the hulls. ENJOY ! life is but a small blob, in this giant space.